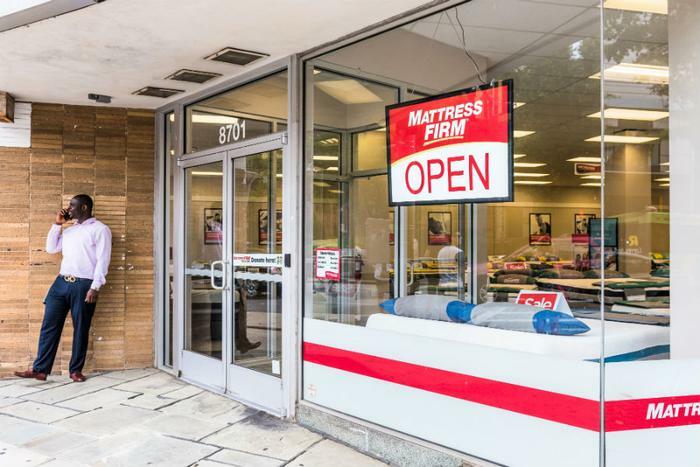 Amid declining sales, in part stemming from the success of online mattress retailers, Mattress Firm has filed for Chapter 11 bankruptcy protection. The company plans to close as many as 700 of its 3,500 stores nationwide. Many of the stores that are slated to be shut down are located "in certain markets where we have too many locations in close proximity to each other," CEO Steve Stagner said in a statement. "We intend to use the additional liquidity from these actions to improve our product offering, provide greater value to our customers, open new stores in new markets, and strategically expand in existing markets where we see the greatest opportunities to serve our customers,” Stagner said. The company, which has nearly 10,000 employees, said it filed motions to support the continued payment of employee wages and health and welfare benefits. Mattress Firm said it has financing that will allow it to keep running its business and said it expects the restructuring process to wrap up within 45 to 60 days. Between 2012 and 2016, Mattress Firm acquired several companies – Mattress Giant, Sleep Train, and Sleepy’s. However, the acquisitions put the retailer on shaky ground. In a court filing, the company acknowledged "several well-intentioned, but ill-advised, marketing and sales promotions." Mattress Firm said it expects to lose $150 million this year. The emergence of boxed mattress sellers like Casper haven’t helped the company find success in its effort to regain stability, either. "I think Casper is the reason why they are in this position," Casper CEO Philip Krim told USA Today. "Casper has really pushed the industry to reinvent itself. We continue to give the customer what they want, and that’s not how the incumbents in this space operated." Krim estimated that about 10 to 12 percent of mattress sales are online. He said he expects that figure to continue to rise over the next several years. Mattress Firm said in its filing that it will not conduct typical liquidation sales or offer special going-out-of-business deals to customers.